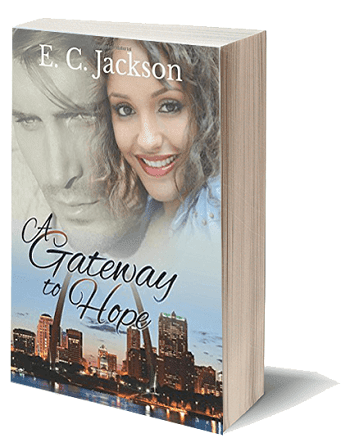 Today we are interviewing E. C. Jackson, author of the inspirational romance "A Gateway to Hope." I’m excited. Finally, the number one goal of my freshman English class has been realized. After a lifetime of wanting to write books, “A Gateway to Hope” is published. This one accomplishment answers many years of prayers. Describe the plot of “A Gateway to Hope” in a few sentences. Neka (Nikhol Lacey) is a beautiful twenty-one-year-old introvert. Without a word to anyone, she leaves home to support a friend when his fiancée breaks off their engagement. James Copley is twenty-nine and every woman’s dream man. Despite his fiancée’s desertion, James still needs a fiancée so he can take control of his family’s business. Neka’s arrival offers the perfect solution to Teri’s defection — until Neka’s father attempts to maneuver James’s scheme into fulfilling the Lacey agenda. Anyone who wonders what their life might have been had they made different choices. And those still seeking God’s purpose for their life. What inspired you to write a book about a shy, beautiful young woman who has the opportunity to help out her friend in a very unique way? I believe that there is a little of Neka in all of us, but life has a way of muddying those unique qualities everyone receives from God. Difficulties, missed chances and thwarted dreams obscure our pathway, and then we accept the mundane instead of utilizing our natural gifts and talents. Neka can allow life to lead her into an alternate position or she can make decisions that fulfill her destiny. Tell us a bit about the protagonists, Neka and James Copley. Though grief came from different sources, they both suffered hurts while growing up. Neka masked the pain by putting on a brave face and pretending not to notice the exclusion and snide remarks. James harnessed each attack, using them to validate his calculating behavior. What are some of the challenges Neka and James face? Can they embrace a life together without losing themselves in the process? How do they blend two diverse lifestyles into one? And they must decide if it’s worth taking a chance on each other. Actually, I liked writing both characters equally. I enjoyed Neka’s optimistic approach to life as she came to terms with reality. And James’s self-styled stage managing of everyone else’s life bumps heads against another master manipulator. How do you hope readers react to “A Gateway to Hope”? I hope they relate to the characters as believable and see the story as a real slice of life. That is part of the slogan on my website. The write way – a real slice of life. The story flowed once I placed my fingers on the keys. Yet, I learned a lot through writing this first book. It’s hard to believe that I rewrote each chapter several times before moving on to the next one. However, I wised up halfway through the first draft and wrote the last 15 chapters before critiquing them. Many scenes were removed during the editing stage. No more overwriting. While writing “A Gateway to Hope,” did you ever use personal experiences as a reference? On occasion, I identified with certain aspects of both characters. Publishing the e-Book was simpler than publishing the paperback. Writing one bestseller per year that adds purpose to the reader’s life. Book promotion is difficult. The introvert in me shies away from exposure. Another standalone book following the hope theme. “A Gateway to Hope” was a labor of love. I hope everyone enjoys Neka and James’s story just as much as I enjoyed sharing it with them. Nikhol Lacey stepped into the muted glow from the wall sconce above the door, grabbed her luggage from the porch, and hurried down the stairs. The path lights cast a shining arc across the yard. Pine scented the air, and fresh-cut grass clung to her sandals. She sidestepped debris along the footpath to avoid snapping any twigs. To anyone looking, the maneuverings would have resembled a child’s game of hopscotch. It seemed like ages had passed, but at last she reached her destination. Lips curving into a fleeting smile, she placed her cases at the cab driver’s feet. She scooted into the car and eased the door shut behind her. But she froze in place when the noisy driver stomped every twig she had missed and slammed the trunk. Her gaze swept over the second-floor windows. The house remained dark inside. Good. No signs of movement. Neka lay back on the cushion but bolted upright when the driver sped away, crunching loose twigs scattered across the road. She brushed her fingers over her neck and chest and then clung to the front of her T-shirt. Familiar landmarks silhouetted against the dusky morning. She sighed, touching the window as her home faded into the receding darkness. Regret surfaced. Would her family understand her leaving home without notice? Massaging her right earlobe, she laid her head against the seat. James needed her. She was the only person able to help him. Finally, someone she cared about required assistance that only she could provide. Tears blurred her vision at the admission that she often felt unneeded. Self-revelation came at a price. Closing her eyes, Neka laid her face into the palms of her hand. She was committed. It was too late to turn back now.